I’ve just spent a week down in Essex, introducing Thrifty Baby to the massed ranks of his nearest and dearest. At the same time, as long time readers will know, Frugal Grandma remains a devotee of the old school thrifty ways. Very little goes to waste and one example of this is her fabled jam cupboard. I have mentioned this before: it is an old kitchen cupboard that my Grandad has fixed up in the garage. The shelves inside are stacked high with jars of glinting jams and jellies. The jars have all been saved and pressed into service time and time again; much of the fruit for the jam comes from her garden, her friends’ gardens and the brambles that dot the sides of the local lanes and highways. Frugal Grandma makes a lot of jam. Every time I see her, I leave with a couple of jars. Recently though, I’ve been gobbling jam like it’s nobody’s business, as keeping Thrifty Baby fed means that I am eating far more than usual. (What this is doing to our grocery budget is the subject for another post…) The other week the unthinkable happened: we actually ran out of Frugal Grandma jam and actually had to go and buy some. The horror! As it turned out, a crisis of a different kind had taken place at Frugal Grandma’s at the same time. Her giant freezer had broken down. The food inside was thawing, fast – and it included a lot of fruit that she had frozen with the aim of turning it into jam at a later date. So the kitchen became an impromptu jam factory, with saved jars hurriedly retrieved and all the heavy-bottomed saucepans pressed into service. The result? A jam cupboard filled to bursting. Frugal Grandma was very concerned that I had actually been out and bought jam, so this time I came away with a box of jars of different flavours, some of which are pictured above. They are delicious. Greengage, blackberry and apple, marmalade, plum… But my favourite is the mysteriously labelled “Raspand”. This is FG shorthand for raspberry and… In this case, the … stands for all the bits and bobs that came out of the freezer, from blackberries to plums and gooseberries. The marmalade, in case you were wondering, is often made by Frugal Grandma from the tiny oranges that grow on an ornamental plant in her conservatory. They are horribly sour when fresh (yes, I have tried them), but make delicious marm. I’ve had fantastic success with a Tefal jam maker. it only makes three jars at a time but it’s fairly foolproof and not such hot and steamy work as traditional jam making. you can buy from Lakeland but they occasionally come up on ebay. if you like to make your own it’s a good investment. Just tried to comment, but not sure it worked! Just found your blog-it is great! Will definitely be a regular readaer in the future! 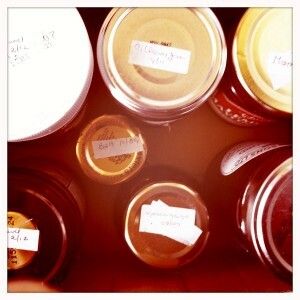 @Prudence – What a shame; hedgerow jam sounds delicious! @Jill & @Pizimac – Yes, I too am intrigued by this Tefal jam maker. It sounds like the jammy equivalent of my slow cooker, i.e. not labour intensive! Will keep my eyes peeled on eBay. At that time i also tried to make elderberry jam, but the fruits didnt have enough pectin in it and so came out more like a syrup. But the rosehips set very well with just regular sugar a regular pot and regular boiling. I must have made over 50 jars of jam last year and today I opened the last one for the childrens breakfast. You are very lucky to have a jam factory of your very own. I love the way that you can taste summer every winters morning and know it is not costing the earth. more recipes please, plum? I just made (and posted about) some very easy rhubarb and ginger jam, hope you try it! When I was young the ornamental orange tree fruits were the ‘dare’ of the street, I think I managed three once! Far more sour than a lemon!